Ernest Hemingway is not the only well-known person to visit the Dry Tortugas and Fort Jefferson. A century before Hemingway and his "Mob" were "marooned," another legend visited the site. This one not to fish but to sketch birds. In 1832 John James Audubon, America's prominent naturalist and foremost bird artist, sailed to the Dry Tortugas and spent several days observing and painting some of the over 200 avian species that find their way to the tiny islets each year. He couldn't have picked a better time. It was May, and the birds were nesting. Audubon's expedition included Dr. Benjamin Strobel, who assisted him during his time In Key West. They arrived on that island May 4, 1832, and sailed to the Dry Tortugas May 10, remaining there until May 16. 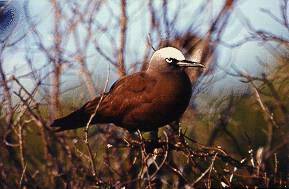 During his stay he drew many species of birds, including the sooty tern, the brown noddy, and the brown booby. On Bird Key Audubon and his group encountered a crew of eggers from Havana, who gathered the eggs from nests on the Tortugas and sailed with them to the Cuban capital, where they sold them. According to Audubon the eggs "offered excellent eating, and our sailors seldom failed to collect bucketfuls of them daily during our stay at the Tortugas." Today the Dry Tortugas are on the main flyway for birds migrating from Cuba and Central America northward to the United States and beyond.. The Islets have become a major birdwatching site for the hundreds of thousands of birders. Although Bush Key, site of the main rookery, is closed to visitors during nesting season, a good pair of binoculars will enable birdwatchers to get a good view of the rookery from Fort Jefferson. Over 200 species of rare birds can be viewed from Garden Key, including terns, boobies, noddies, herons, and the Magnificent Frigatebird. For the increasing number of eco-tourists to whom birdwatching is a favorite hobby, the Dry Tortugas are definitely one of the best places to view the objects of their hobby.